Seriously as I go through the things I have to post this month I keep thinking...that's not that impressive. Probably everybody does this for a quick meal. Then I remember what kind of hell I was living in taking two Master's courses simultaneously and I think "Eff Yah that's IMPRESSIVE!" (and I don't use 'eff' much). So, it may not seem like much and it's by no means gourmet nor innovative, but it was delicious and quick and energy-giving, what more can you ask for when you're spending hours typing about linguistic concepts followed by English language learner teaching strategies? Saute Mushrooms and Onions. Whisk one egg with milk, salt and pepper throw into a small hot skillet cover with a lid, cook thoroughly. 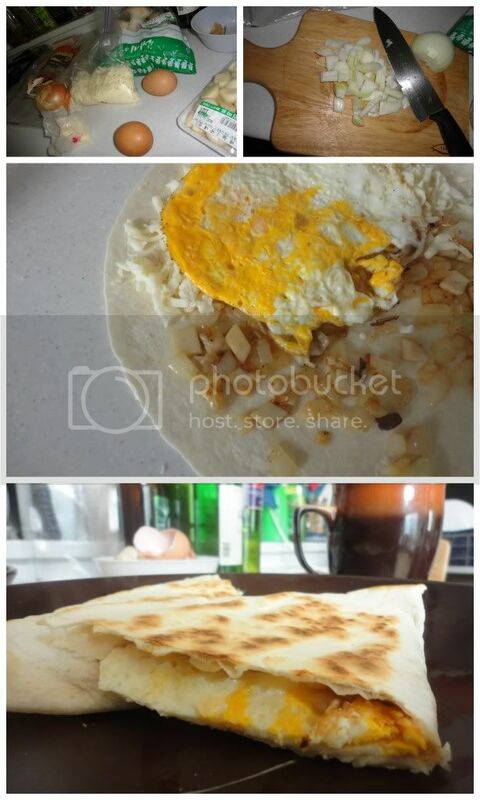 Throw some cheese on a tortilla, top with egg and mushroom/onion mix, fold, place in a large hot skillet until it's melty on the inside, crispy on the outside and get back to work.